Q1. Which of the following is the most likely organization from which an enterprise could obtain an administrative assignment of a block of IPv6 global unicast IP addresses? d. Global unicast addresses are not administratively assigned by an outside organization. Answer: A. One method for IPv6 global unicast address assignment is that ICANN allocates large address blocks to RIRs, RIRs assign smaller address blocks to ISPs, and ISPs assign even smaller address blocks to their customers. Answer: D. Inside a quartet, any leading 0s can be omitted, and one sequence of 1 or more quartets of all 0s can be replaced with double colons (::). The correct answer replaces the longer 3-quartet sequence of 0s with ::. Q3. Which of the following answers lists a multicast IPv6 address? Answer: D. Global unicast addresses begin with 2000::/3, meaning that the first 3 bits match the value in hex 2000. Similarly, unique local addresses match FD00::/8, and link local addresses match FE80::/10 (values that begin with FE8, FE9, FEA, and FED hex). Multicast IPv6 addresses begin with FF00::/8, meaning that the first 2 hex digits are F.
Answer: A and C. IPv6 supports stateful DHCP, which works similarly to IPv4’s DHCP protocol to dynamically assign the entire IP address. Stateless autoconfiguration also allows the assignment by finding the prefix from some nearby router and calculating the interface ID using the EUI-64 format. Answer: A and D. Stateless autoconfiguration only helps a host learn and form its own IP address, but it does not help the host learn a default gateway. Stateless RS is not a valid term or feature. Neighbor Discovery Protocol (NDP) is used for several purposes, including the same purpose as ARP in IPv4, and for learning configuration parameters like a default gateway IP address. Answer: A and D. OSPFv3, RIPng, EIGRP for IPv6, and MP-BGP4 all support IPv6. Answer: C and E. The configuration explicitly assigns the 3456::1 IP address. The interface also forms the EUI-64 interface ID (6444:44FF:FE44:4444), adding it to FE80::/64, to form the link local IP address. Q8. In the configuration text in the previous question, RIP was not working on interface Fa0/0. Which of the following configuration commands would enable RIP on Fa0/0? Answer: E. RIPng configuration does not use a network command; instead, the ipv6 rip command is configured on the interface, listing the same tag as on the ipv6 router rip command, and the enable keyword. Q9. Which of the following IPv4-to-IPv6 transition methods allows an IPv4-only host to communicate with an IPv6-only host? Answer:D. Network Address Translation–Protocol Translation (NAT-PT) translates between IPv4 and IPv6, and vice versa. The two tunneling methods allow IPv6 hosts to communicate with other IPv6 hosts, sending the packets through an IPv4 network. Dual-stack allows a host or router to concurrently support both protocols. Answer: C, D, E. OSPFv2 does not use the network command under global confiuration mode, nor does it use wildcard masks as IPv4 does. However, they can both use the interface command to confiure OSPF, use a 32-bit RID, and both use LSAs. Q11. Which of the following is true when describing a global unicast address? C. These are like private addresses in IPv4 in that they are not meant to be routed over the Internet. D. These addresses are meant for nonrouting purposes, but they are almost globally unique, so it is unlikely they will have an address overlap. Answer: B. Unlike unicast addresses, global unicast addresses are meant to be routed. Q12. Which of the following is true when describing a unicast address? Answer: A. Packets addressed to a unicast address are delivered to a single interface. For load balancing, multiple interfaces can use the same address. Q13. Which of the following is true when describing a link-local address? A. Packets addressed to a broadcast address are delivered to a single interface. Answer: C. Link-local addresses are meant for throwing together a temporary LAN for meetings or a small LAN that is not going to be routed but needs to share and access fies and services locally. Q14. Which of the following is true when describing a unique local address? A. Packets addressed to a unique local address are delivered to a single interface. D. These addresses are not meant for Internet routing purposes, but they are unique, so it is unlikely they will have an address overlap. Answer: D. These addresses are meant for nonrouting purposes like link-local, but they are almost globally unique, so it is unlikely they will have an address overlap. Unique local addresses were designed as a replacement for site-local addresses. Q15. Which of the following is true when describing a multicast address? A. Packets addressed to a multicast address are delivered to a single interface. B. Packets are delivered to all interfaces identified with the address. This is also called a one-to-many address. C. A multicast address identifies multiple interfaces and is delivered to only one address. This address can also be called one-to-one-of-many. Answer: B. Packets addressed to a multicast address are delivered to all interfaces identifid with the multicast address, the same as in IPv4. It is also called a one-to-many address. You can always tell a multicast address in IPv6 because multicast addresses always start with FF. Q16. Which of the following is true when describing an anycast address? A. Packets addressed to an anycast address are delivered to a single interface. C. This address identifies multiple interfaces and the anycast packet is only delivered to one device. This address can also be called one-to-one-of-many. Answer: C. Anycast addresses identify multiple interfaces, which is somewhat similar to multicast addresses; however, the big difference is that the anycast packet is only delivered to one address, the fist one it fids defied in the terms of routing distance. This address can also be called one-to-one-of-many, or one-to-nearest. Q17. You want to ping the loopback address of your IPv6 local host. What will you type? Answer: C. The loopback address with IPv4 is 127.0.0.1. With IPv6, that address is ::1. Answer: C, D. Adjacencies and next-hop attributes now use link-local addresses, and OSPFv3 still uses multicast traffi to send its updates and acknowledgments with the addresses FF02::5 for OSPF routers and FF02::6 for OSPF designated routers. These are the replacements for 224.0.0.5 and 224.0.0.6, respectively. A. A RA would be used by R1 to communicate its layer 2 MAC address to Host A. 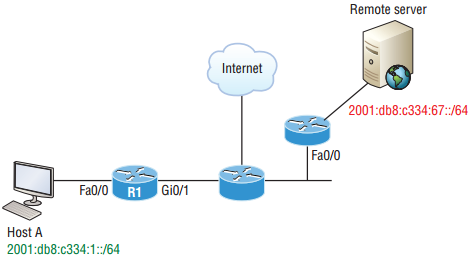 B. OSPFv2 is used for the routers to share IPv6 routes. C. IPv6 uses a two-part addressing scheme, similar to the way IPv4 uses a network and host portion of an IPv4 address. D. Host A would send the server’s link-local address to the router. Answer: A, C. Host A would send an RS to R1, which would respond with an RA, if the host hasn’t already learned this information previously. The host now has the default gateway information it needs to send packets to a remote network. IPv6, like IPv4, has both a network portion and host portion in the IPv6 packet. Q20. A host sends a router solicitation (RS) on the data link. What destination address is sent with this request? Answer: C. A router solicitation is sent out using the all-routers multicast address of FF02::2. The router can send a router advertisement to all hosts using the FF02::1 multicast address. Q21. IPv6 unicast routing is running on the Corp router. Which of the following addresses would show up with the show ipv6 int brief command? Answer: B. This can be a hard question if you don’t remember to invert the 7th bit! Always look for the 7th bit when studying for the Cisco exams. The EUI-64 autoconfiuration inserts an FF:FE in the middle of the 48-bit MAC address to create a unique IPv6 address. Q22. A host sends a type of NDP message providing the MAC address that was requested. Which type of NDP was sent? Answer: A. The NDP neighbor advertisement (NA) contains the MAC address. A neighbor solicitation (NS) was initially sent asking for the MAC address. Q23. To enable OSPFv3, which of the following would you use? Answer: A. To enable OSPFv3, you enable the protocol at the interface level as with RIPng. The command string is ipv6 ospf process-id area area-id. A. Leading zeros are required. B. Two colons (::) are used to represent successive hexadecimal fields of zeros. C. Two colons (::) are used to separate fields. D. A single interface will have multiple IPv6 addresses of different types. Answer: B, D. To shorten the written length of an IPv6 address, successive filds of zeros may be replaced by double colons. In trying to shorten the address further, leading zeros may also be removed. Just as with IPv4, a single device’s interface can have more than one address; with IPv6 there are more types of addresses and the same rule applies. There can be link-local, global unicast, multicast, and anycast addresses all assigned to the same interface. A. An IPv6 address is 32 bits long, represented in hexadecimal. B. An IPv6 address is 128 bits long, represented in decimal. C. An IPv4 address is 32 bits long, represented in decimal. D. An IPv6 address is 128 bits long, represented in hexadecimal. Answer: C, D. IPv4 addresses are 32 bits long and are represented in decimal format. IPv6 addresses are 128 bits long and represented in hexadecimal format. Q26. Which of the following descriptions about IPv6 is correct? B. Broadcasts have been eliminated and replaced with multicasts. C. There are 2.7 billion addresses. D. An interface can only be configured with one IPv6 address. Answer: B. There are no broadcasts with IPv6. Unicast, multicast, anycast, global, and linklocal unicast are used. Q27. How many bits are in an IPv6 address field? Answer: D. There are 16 bits (four hex characters) in an IPv6 fild. B. Link-local addresses start with FF00::/10. C. Link-local addresses start with FE00:/12. Answer: A, D. Global addresses start with 2000::/3, link-locals start with FE80::/10, loopback is ::1, and unspecifid is just two colons (::). Each interface will have a loopback address automatically confiured. A. The first 64 bits represent the dynamically created interface ID. D. Leading zeroes in an IPv6 16-bit hexadecimal field are mandatory. Answer: B, C. If you verify your IP confiuration on your host, you’ll see that you have multiple IPv6 addresses, including a loopback address. The last 64 bits represent the dynamically created interface ID, and leading zeros are not mandatory in a 16-bit IPv6 fild.